.354" x 24" x 48" Lexan™ MR10 Polycarbonate Sheet with Margard™ II Coating | U.S. Plastic Corp.
Mar/UV-resistant Lexan™ Margard™ MR10 sheet combines the impact strength of LEXAN polycarbonate sheet with a proprietary abrasion/UV resistant surface that approaches glass in performance. Lexan™ Margard™ MR10 Sheet with Margard™ coating backed by a ten-year limited warranty against yellowing, abrasion resistance, breakage, loss of light transmission, and coating failure.) Lexan™ Margard™ MR10 sheet's unique coating is graffiti resistant enabling restoration to a like-new condition. In addition, Lexan™ Margard™ MR10 sheet offers improved resistance to weathering as well as forced-entry protection. 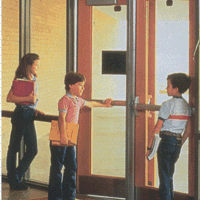 It is an excellent candidate for use in stores, public buildings, schools, bus shelters and other high traffic areas. Because of its high mar-resistant surface, paint, adhesives and other materials will not adhere to its surface. The coating is applied to both sides, therefore it helps eliminate second-surface decoration.